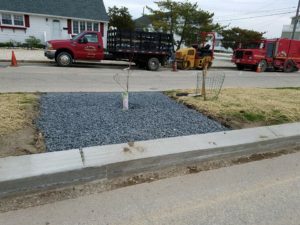 The road construction on Barnegat Ave is almost completed at this point. There are only two blocks left from 3rd to 5th streets to be completed. The new curbs, which run from 3rd st to 11th st, are rather high and the median will now be difficult to access with a vehicle or bicycle. 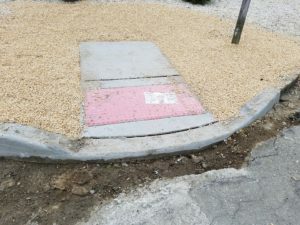 All the upgraded storm drains are in and also the handicapped accesses. In the first picture the old curb is visible merging with the new curb on the north end of the project. 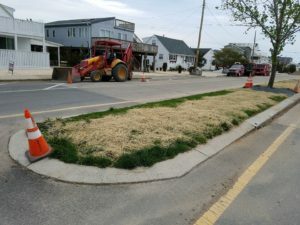 The beach fill is ongoing still in Brant Beach and will soon begin in Harvey Cedars. Surf City is scheduled to begin fill operations as soon as Harvey Cedars is complete. All the details can be found HERE in The SandPaper. Coming to a beach near you soon!